If you are looking for the Windows alternative menus, OrdinarySoft can offer you innovative solutions that will make you enjoy working with Windows 10! Start Menu 10 has unique interface solutions: virtual groups and one-click launch. The program shows you a list of recently and most frequently used programs. It provides special features of cognitive perception and visual memory. 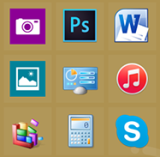 Start Menu 10 has the customizable list of folders and applications. Add any of 25 system folders of any of your folders to this list, and get quick access to recently used files at any place on your computer.